← How Deep is the Neuron? A detailed discussion of the effect of sublethal stress on the evolution of invertebrates is given in the book of Guex (2016; review in Guex and Verkhratsky, this issue). In this paper we will present a brief description of the effect of major stress on the development and evolution of some foraminifera and ammonoids. In the two cases discussed below, we show that retrogradation does’nt generate only retrograde evolution but also retrograde polymorphism. One notable case of polymorphisms was named “Buckman’s law of covariation”. Buckman first discovered that some extreme morphotypes of atavistic habitus with simple and archaic morphologies show a perfectly continuous morphological spectrum towards the most advanced forms in the same sedimentary beds (synchroneity of the ammonite population). One example given by Buckman concerns the beautiful and famous ammonite genus Amaltheus of the gibbosus group which first occur during the Upper Pliensbachian located at the transition between the Gibbosus and Spinatum zones in the Late Pliensbachian (see Guex 2016 for references). The evolute spinose zonal index Amaltheus gibbosus is an atavistic form generated from involute A. margaritatus which strongly resembles the ancestral morphology of the Sinemurian Eoderoceras. We consider as fascinating the fact that some planctonic foraminifera (e.g. the lineage Ticinella Thalmanninella) display a covariation which is similar to that observed in some ammonoids. Foraminifera are well known to be extremely sensitive to environmental stress and several classical studies have shown that the variability of these organisms was polarized in function of thermal and chemical stress and by depth. The evolutionary trend observed in the Ticinella → Thalmaninella lineage illustrates the frequent evolutionary trend occurring in coiled shells (Fig.1): in the T. greenhornensis–T. multiloculata plexus a strong keel is developed at the maximum lateral curvature of the chamber, demonstrating the relation between morphogen concentration and strong curvature of the membrane secreting the shell. During episodes of environmental stress such as anoxic events, a retrograde polymorphism is observed in these protists, which is perfectly similar to the case of Amaltheus described above, as illustrated in Fig.1. The fact that Buckman’s First Law of Covariation applies to both unicellulars and metazoans proves that similar biochemical signals are at work in both types of organisms, the membrane of foraminifera functions in a way similar to the ammonoids’ mantle. Fig.1 (a) Evolutionary lineage going from the simple and evolute ancestral planktonic foraminifera Ticinella (right) towards the involute and carinated Thalmaninella. The variability of a single synchronous population illustrated in Fig.1-a mirrors the evolutionary sequence observed in this group. (b) Highly evolute “Eoderoceras-looking” (right) Amaltheus gibbosus showing a similar trend from evolute towards involute coiling (A.margaritatus) during a Pliensbachian environmental stress episode. Covariation depends on the internal shell geometry, namely the lateral and ventral curvature of the shell which controls the amount of morphogens present in the more or less curved mantle, the most salient ornamentation being present where the whorls are most curved, shells with slight angular bulges often being spinose or carinate and flat ones being almost smooth. Our empirical conclusion was that the covariation phenomenon could be explained within the framework of Gierer-Meinhardt’s reaction diffusion models. To prove that conclusion, we simulated the distribution of “morphogens” (in the physical sense) in a quadrangular body chamber and demonstrated that morphogens maxima are located, as expected, in the part of the mantle located in the angular parts of the shell. For this, we calculated a numerical solution of the Gierer-Meinhardt equations for a cross section through an ammonite shell, orthogonal to the growth axis. In the computation, the units of distance, time and concentration are arbitrary. The boundaries of the domains are supposed to be impervious for the inhibitor. The outer boundary (arc of circle) is unaffected by the activator whereas the other boundaries are susceptible to this factor. The choice of these boundary conditions is motivated by the following arguments: The activator is supposed to diffuse freely outside the mantle’s cells (or the membrane of foraminifera) into the environment (intercellular medium and sea water). The reaction-diffusion equations are solved numerically on a hexagonal mesh containing 1500 nodes corresponding to a hexagon radius of 0.23 units. The concentrations a(x,t) and h(x,t) are determined at each node of the mesh. The initial values of the concentrations at t = 0 correspond approximatively to the values taken from the (unstable!) homogenous stationary solution. We add small random deviations ε(x,0) to the concentrations of the activator to allow the system to leave the initially homogenous state. The stationary inhomogeneous solution is found using a standard iterative procedure (details in Guex 2016 with references). Similar conclusions were obtained by Newell et al. (2008) in their general study of phyllotaxy: “… buckling leads to a template for primordia, it is growth that leads to the visible primordial bumps and phylla. This growth is postulated to be a biochemical response, perhaps through chemical agents such as auxin, to the local stress or curvature inhomogeneities of the buckled surface …”. In our carbonate shelly invertebrates, the morphogens have obviously nothing to do with auxin but could simply be Ca2+ ions. The output of our calculation shows that the distribution of the activator and inhibitor in a bended shell displays very low concentration in the smooth part and very high concentration in the curved part, both in foraminifera and ammonoids. More recently, an alternative model leading to the same kind of conclusions has been proposed by Mercker et al. 2013 where the authors write that “biomechanical forces may replace the elusive long-range inhibitor and lead to formation of stable spatially heterogeneous structures without existence of chemical prepatterns. We propose new experimental approaches to decisively test our central hypothesis that tissue curvature and morphogen expression are coupled in a positive feedback loop”. It might be useful to note that a multitude of mathematical models can simulate the pattern formation in shelly organisms. To illustrate this we can mention the fact that phyllotaxy, a domain studied by botanists, has been formally described by models developed in three totally different fields of mathematics: pure geometry by Van Iterson (1907), pure physics by Douady and Couder (1992) and reaction-diffusion by Meinhardt et al. (1998). 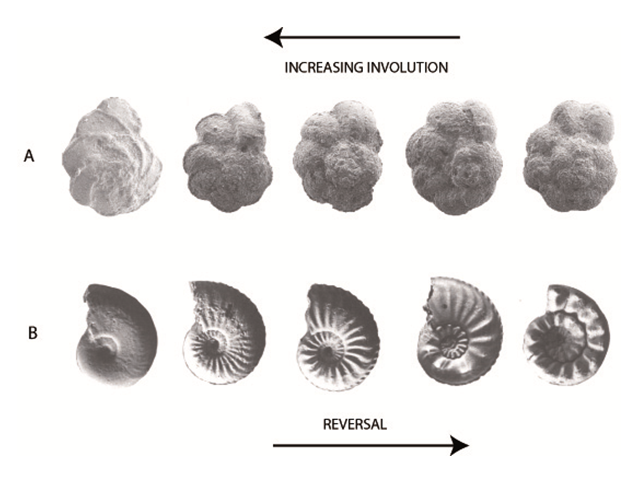 In other words it is clear that our model of spine formation in ammonites is obviously not the only possible (all refs. in Guex 2016).